No-reply emails are bad. This is worse. 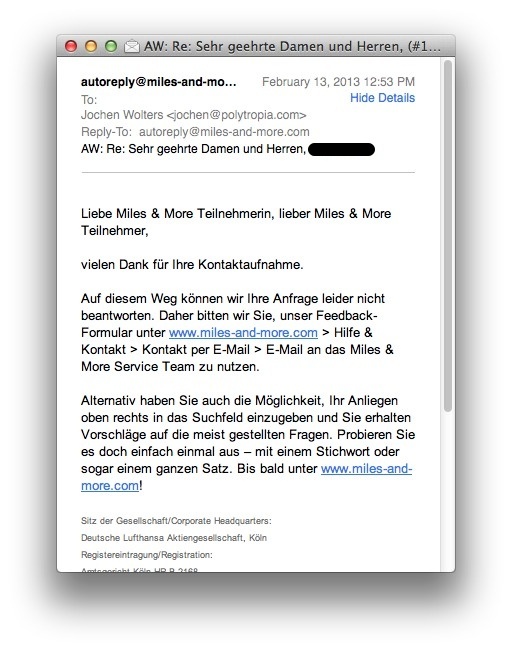 In yet another attempt at claiming missing airline reward miles, I had contacted Lufthansa’s Miles & More loyalty program about some serious problems with their website. They responded via email a few days later, explaining that, in order to use the online mileage claim form, you must have purchased a ticket directly from their (partner) airline. That, however, was exactly what we had done. Hence, I wrote another email to provide them with more details and included a link to my blog post — just in case their developers would want to investigate this further. The next email I received from Lufthansa was definitely not what I had expected. Unfortunately, we cannot answer your inquiry this way. 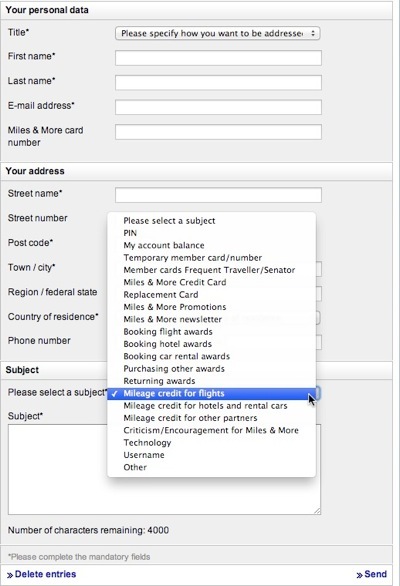 Therefore, we ask you to use our feedback form at www.miles-and-more.com > Help & Contact > Contact via E-Mail > E-mail the Miles & More Service Team. Alternatively, you can enter your request in the top-right search field, and you will receive suggestions regarding the most commonly asked questions. Why don’t you just give it a try — with a keyword or even an entire sentence. See you soon at www.miles-and-more.com! When you contact a company for customer support these days, they often do not accept direct responses to their emails. Instead you’re being steered to another communications channel, like a web form. Another tell-tale sign that you are not supposed to respond directly is a from: address that begins with something like do-not-reply@… . Generally, forcing customers to use an online contact form, makes things considerably easier for the company. It ensures that a modicum of the customer’s personal data is collected via mandatory form fields; it allows routing the inquiry to the correct company department by making the user pick from a finite set of inquiry types; and it encourages the customer to keep their messages short by offering a fairly small text field for the actual inquiry. That said, I had already provided all that information when I submitted my original inquiry via this very form. Linking the email exchange to that data would have been a snap, because a case number was included in the subject line of all emails going back and forth, including their eventual “can’t talk to us this way!” message1. The initial response did include a snail mail address for the Miles & More support center. I have since sent paper copies of the tickets to that address and, hopefully, will receive the desired mileage credit. Nevertheless, it does make me wonder what caused this breakdown in this communications process between Lufthansa and me. Was it an issue with the technical implementation, or is it actually intentional to make it as tedious as possible to keep a customer support case open?